4th day of Christmas: We put up the Xmas tree! 1). Assemble the Christmas tree, and place in the desired position. 2). Plump out those flat Xmas tree branches – don’t be scared to go BIG with those mean fur branches! 3). Look at your pile of last years Christmas tree decorations and amaze yourself on those little cute Xmas decks you forgot you had! 4). Unravel your Christmas tree lights and ensure they all work! We bought our new Xmas tree lights from Argos. Once checked, arrange them on your tree. Tip: it’s far easier to arrange your lights when they’re switched on – as it’s easier to see where any dark areas of the tree are! (Please note, our lights flash on and off – hence half the tree looking ‘unlit’). 5). Once your happy with the lights, you can start to decorate your Christmas tree. Tip: it’s often easier to sort the Xmas decks in to matching groups, as it allows you to visually see how many of each decoration you have. Our decorations are old. Most of them are either from Marks & Spencer or House of Fraser, whilst most of the baubles were bought out of cheapness from various stores. 6.) Structure and mix and match each area of your tree. Have fun decorating your Christmas tree, get the kids involved perhaps?! Tip: Do not place large baubles too near the top of your Christmas tree. 7.) Once you’ve used up all your Xmas tree decorations, stand back and admire! Oh my good god! I am so excited for Christmas and I can’t wait to dig the Christmas tree out, let alone dust off last year’s Christmas tree decorations! I’ve actually wasted no time in sourcing potential new Xmas decorations. Let me know what you think guys! Firstly, I always think it’s a good idea to find those bold Xmas tree baubles in a Christmas bauble pack. These baubles pictured below are fantastic! Don’t you just love those purple baubles mixed in with cream and red baubles? With a price tag of £10 for 50 coloured baubles from Next, we think these Xmas tree decorations are a great find – wouldn’t you agree? Other great finds we have come across whilst browsing trendy Xmas tree decorations include the following from Marks & Spencer. M&S have a fabulous range of must have Christmas decorations. The Marks and Spencer Christmas Collection has a fantastic 3 for 2 offer across their range of Christmas tree decorations – you just can’t miss this one guys! Don’t you just think that the red and white knitted bauble is so cute? With Halloween and Bonfire night out the way, Kelly and I are already planning for our Christmas decorations. Personally, I love Christmas and decorating a Christmas tree is my speciality – or at least i’d like to think it is! I’ve put together a list of some of my most inspiring Christmas trees. 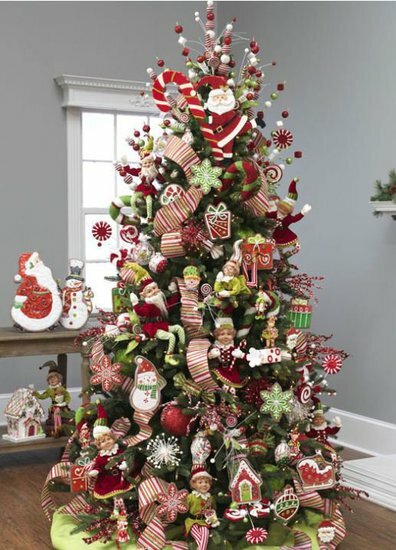 These 2012 Christmas tree ideas boast luxurious design, quirky appeal and are like nothing I have ever seen before. First up we have this Raz Christmas tree which features deliciously inviting cookies! This one is sure to make the kids smile. It’s also fun looking, yet masterfully decorated to boast a fun yet luxurious over all design. 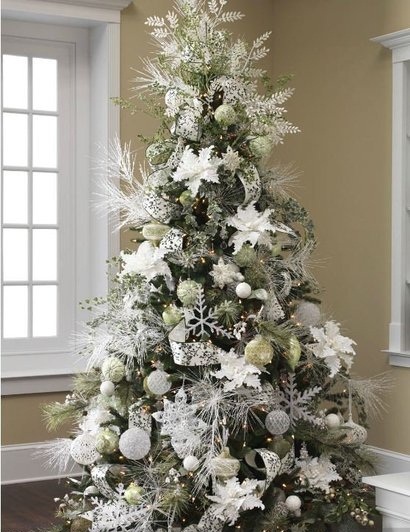 Secondly, we have this gorgeous looking RAZ Xmas tree which uses whites and creams in the over all design. I love how simple yet striking the use of colour on this Christmas tree is. 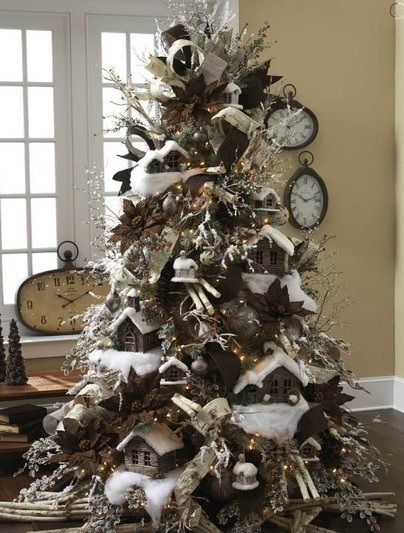 This tree is certainly well suited to any room decor, with its plain and stylish statement look. Thirdly we have a traditional Christmas tree design idea. I love the way traditional Xmas trees create a warm cosy feel during the Christmas festivities. There is nothing better than sitting in front of the TV, watching Christmas films with the ‘ole Christmas tree design stood proudly in the corner of the room. The use of red and gold Christmas decorations certainly sets off this tree a treat. For our next tree we have this fantastic unusual Christmas tree design. This tree is a real show stopper! Those winter roof tops look simply desirable. I especially love the rustic feel these wooden Xmas decorations give. Last but by no means least is my favourite inspiring Xmas tree. 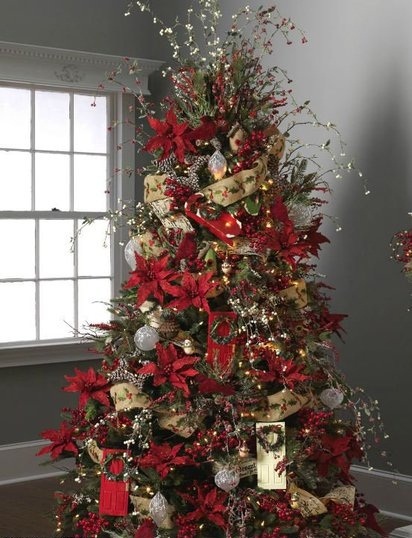 This luxurious Christmas tree is a real eye catcher! 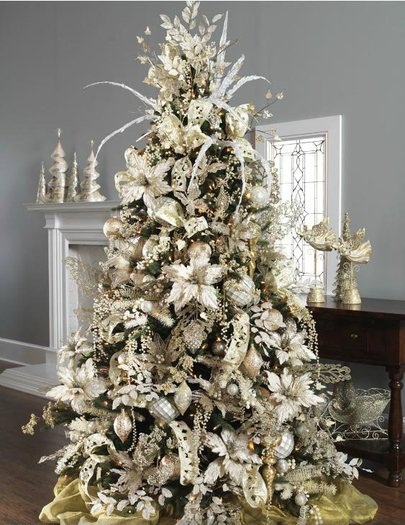 The branches are completely covered in cream and champagne coloured Christmas decorations. The added flare towards the top of this Xmas tree gives a contemporary Christmas tree design which meets extravagance. What colour decorations do my lovely blogging friends go for? Are you inspired by any of these Christmas tree designs? Feel free to leave your comments!